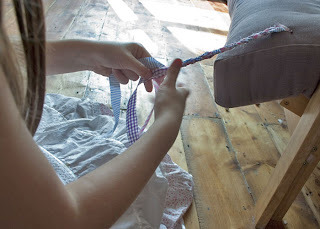 Here's my 8 year old busy plaiting some strips of cloth to make the centre piece of a brooch for her friend Katie's birthday present. 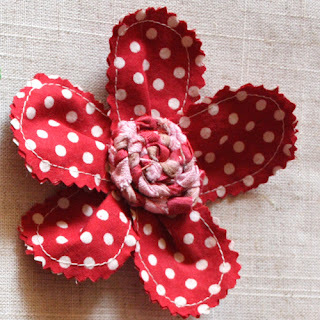 She chose the colours and the fabrics and we made the brooch together. 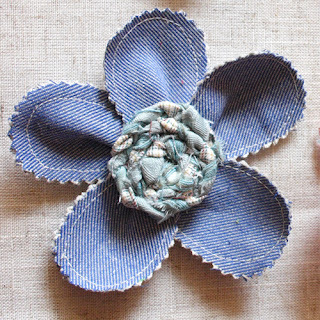 It is a version of our 'Raggy Flowers'. 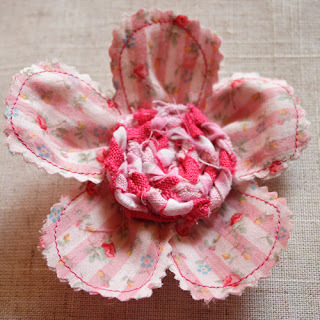 The centre piece made from plaited strips and the petals stitched either by machine or as we have done here with a simple running stitch and with pinked edges. 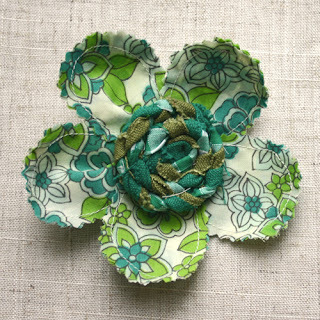 These petals were backed on felt as an experiment. It gives a more structured feel. (whereas the others below still have that blousy soft feel which i rather like). It looked really sweet and her friend was delighted. 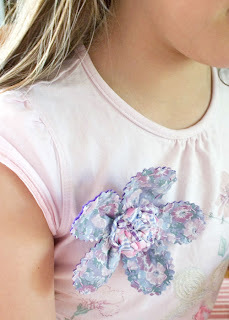 The pretty floral fabric is from a soft lawn Laura Ashley dress that my youngest used to wear. 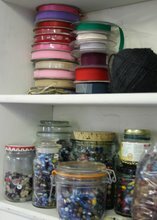 We have a cupboard at home full of precious fabrics for special projects. She wanted to use some of her special fabric for the gift as she loves Katie too. 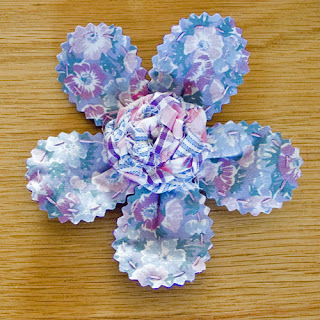 These are really pretty - I too love it when my daughters want to make something rather than whinge on about the tv or computer. 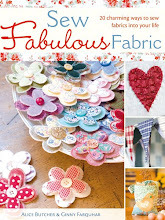 They are FAB! I'm loving the polka dot one! What is it about polka dots???? Why can I never resist them!!!! Thankyou for leaving a comment on my blog. It is so nice to hear from you. What lovely helpful daughters you have (could I swap one for a toddler? cute, but no use to me at home!). Those flowers are beautiful, I love the wacky vintage green, I'm going to go and have a look at your notonthehighstreet shop now. Keep up the good work. 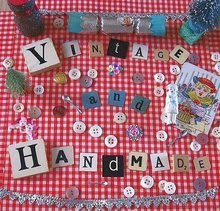 well they're just so fun and cheery, with a hint of wholesome 50's nostalgia.. i love them too! Thanks Victoria for offer of cute toddler....very tempting as they are so lovely at that age.. enjoy!